Challenges of controlling zoonotic diseases | Infonet Biovision Home. (c) Agromisa Foundation and CTA, Wageningen, 2008. In this chapter we list problems that people or governments encounter when they want to get rid of zoonoses and give some solutions as well. Sudden death of an animal (especially cattle). This can be the result of lightning, but you should really consider the possibility of anthrax! So: do not touch nor eat animals that died without any obvious cause! Always call your local vet, if possible. Abortion. 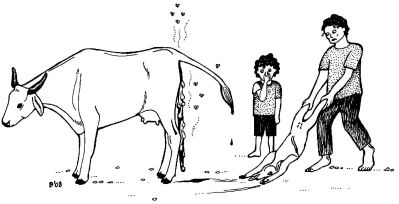 Some zoonoses, like brucellosis, cause animals as well as humans to abort. Make sure that pregnant women do not touch the fluids of an aborted animal. They should not touch the dead foetus either! The signs and symptoms of zoonoses in humans are often similar to other (ordinary) diseases, like flu. Medical persons may not recognize a disease as zoonosis and, especially in remote areas, medical practitioners may be less qualified to do so. The medical world and veterinary world often exist as separate entities. Medical persons may cure humans that are ill from a zoonosis, but they often do not know how to prevent zoonotic diseases from occurring. Prevention of zoonotic diseases is best done through veterinarians: educating people about animal health, vaccination of animals and so forth. But neither the medical professionals nor the veterinary professionals feel really responsible for taking care of good preventive programmes. This may change if the medical professionals and veterinarians would cooperate more. Globalization is seen as one of the most challenging issues when it comes to the prevention of zoonoses. People can travel from one side of the world to the other without any check on whether they are carrying diseases. Control measures that avoid worldwide spread of diseases are very costly and are not affordable for many countries. "New" zoonoses have emerged during the past few decades. We put "new" between quotes because these emerging zoonoses are not always completely new diseases. Avian influenza, for example, already exists and is a well-known disease. What is new about the recent outbreaks is that avian influenza caused human deaths and that there is a possibility that this virus may cause a new worldwide influenzaepidemic. Other examples of emerging zoonoses are BSE (Bovine Spongioform Encephalopathy) and SARS, which have raised much public awareness. People fear that new diseases and new zoonoses can emerge any moment. At least it shows that there is still a lot we do not know. Medical organizations need to prioritize their goals. Eradication or control of diseases like human tuberculosis, malaria and HIV/AIDS are currently given much higher priority than any other infectious disease, including zoonoses. This results in a lack of (financial) resources for research on zoonoses and for preventive measures against zoonoses. Zoonoses that do get attention are those that are a (possible) threat to the richer countries in North America and Europe. Knowledge about zoonoses is lacking in many ways. Livestock owners and pet owners, for instance, often do not know about the existence of zoonoses. Or if they are aware of zoonoses they are not sure about what a zoonosis is and what is not. We hope that this book will fill in the gaps and provide the owners and providers of animals with the relevant information. Knowledge is also lacking among researchers, veterinarians and medical doctors who do not exactly know where and how often zoonoses occur. For example, to medical professionals, bovine tuberculosis is not an issue, because they see human tuberculosis as a much bigger problem. Veterinarians on the other hand focus especially on bovine tuberculosis and say that it is a major threat to humans in African countries. But because there is no exact data on bovine tuberculosis we do not know how significant it really is. Exact data is only available on "new" emerging zoonoses and three of the "older" zoonotic diseases (echinococcosis, trypanosomiasis and rabies). Attempts to get rid of a certain disease by preventive measures are often difficult. People do not like to change their habits or beliefs. This goes for almost everyone, no matter where (also applicable to western countries). Development programmes will not succeed if they do not listen to the people they want to help. If people believe that a curse has made them ill, it will be extremely difficult to tell them that their disease is due to a bacterium or a virus that they cannot see. Mayan views are very different from western views: they use concepts of "wind" and "bad wind" if they speak about health and disease. It is therefore very hard to explain the existence of bacteria and microbes to Mayan people. An educational organization in southern Mexico used the concept of "wind" to explain how diseases are transmitted and this concept is now successfully used in health campaigns. Preventive measures have an added dimension of difficulty. If people are ill and are given medicines that make them better, then the relationship between medicine and getting better is clear. If people who are not ill are asked to change their eating habits while they continue to remain healthy, then the relationship between changing eating habits and remaining healthy is not so clear.